Condensing, modulating, hot water supply, pool, and hydronic heating boilers. The gas-fired Futera Fusion™ now brings the field-proven performance of Futera III Modulation boilers and water heaters to the ultimate levels of efficiency and reliability. This innovative design is the ideal choice for applications with low operating, return, or make-up water temperatures. Unlike most condensing products available today which publish the highest efficiencies at the lowest inputs, the Fusion is capable of attaining efficiencies as high as 98% at Full Input! The full modulation firing system continuously varies the energy input to precisely match heating load without over-firing and wasting fuel. This provides extremely high part-load efficiencies. System sizing is made simple with models available from 500 MBH to 2000 MBH. If you're looking to maximize operating efficiency, reliability, and flexibility in domestic hot water, pool, and hydronic heating applications, the Fusion is your heating solution. RBI offers a complete line of finned copper tube boilers and water heaters. 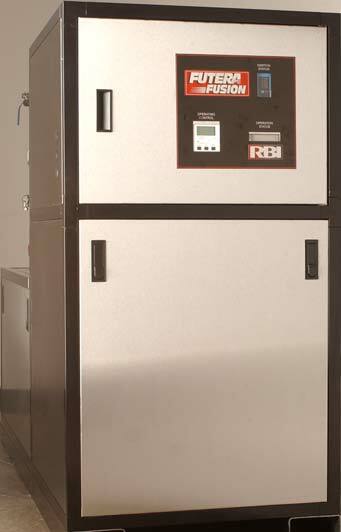 RBI high efficiency boilers and condensing boilers are among the most competitively priced units on the market.